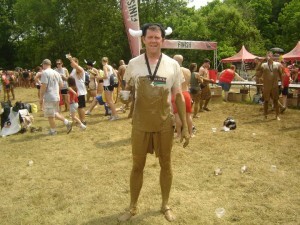 Post-Warrior Dash in Vibram FiveFingers KSOs. My first OCR. Up to now I haven’t done a lot of talking about actually racing other than the article on how MovNat can prepare us for various obstacles in a race. I got a regularly scheduled promotional email from one of my favorite shoe companies, VivoBarefoot, last Friday, and it was highlighting their new shoe known as The Trail Freak. It’s a trail running shoe, with a minimalist lugged sole for traction and maximum proprioception while still protecting you from the elements. It definitely looks like it’s worth trying out. But even though I wear VivoBarefoot shoes almost every day (they have a fantastic line of business-casual type shoes that are also minimalist), my go-to race and training shoes are probably going to continue to be Vibram FiveFingers (VFFs). The reason? Those toes. Believe it or not, having free toes has helped me get through obstacles in a race. A lot of people were having trouble with it because it’s a hard obstacle, especially since it’s at the end of the race and you’re pretty exhausted. And technique is key as well – as it’s hard to train something like that due to the lack of opportunity. But I was able to run up the wall and get to the point where I had my feet able to touch the rope. And because of my VFFs, I was able to wrap my toes around the rope enough that I was able to use more leg strength to push myself up. If you watch the video above, you’ll see that not having your toes free makes that not an option. There are other obstacles where having your toes available to grab is key as well – other climbing and rope obstacles, mostly. The Colossus is just my favorite example. And there are other benefits as well, I think. One of those other benefits to VFFs in an obstacle race is for any mud-, swimming-, or water-related obstacle, where the water sheds nicely and there’s less area for mud to clamp onto. The KSOs were actually slightly better for this factor as they were sleeker and you could rub the mud off the bottoms fairly easily because they were smooth. But to me, the slightly lugged soles of the Spyridon model are still minimalist enough that they retain most of this ability while giving better traction. Yet another benefit: they don’t wear out quickly. These things are solidly built and last a really long time. One reason is that they’re just designed well, but the other reason is that you don’t have to worry about the sole breaking down because it’s just a flat piece of material. It doesn’t have all the foam and other techie junk to complicate matters in your shoe. There’s no silly “300 miles rule” (I’m just pulling that number out of the air, so don’t quote me on that number) about when you should replace your running shoes. If you wear through the bottoms, you need to replace them. Period. Or you may have to if the stitching gives out at some point. That’s it. They last a long time. I have had two issues with my VFFs: first, I’ve broken my toe wearing them while hiking. I was walking along, perhaps not watching where I was walking perfectly, and a branch from a strong bush got between my pinky toe and the next one, and pulled it back. It hurt. Normal shoes with a toe box would have prevented that, as there would have been no toe to grab. But for me, the ability to move better that the VFFs give me is worth the risk. And second, and this part is important: if you don’t have time to adjust your running style to use the shoes properly then you should stick with conventional-soled shoes. One goal of a minimalist sole is to prevent you from heel-striking like many people do when they run. That heel-strike is part of the reason that many people have such problems with running injuries – poor stride and foot-landing/impact. Christopher McDougall talked about this a lot in the book Born to Run: A Hidden Tribe, Superathletes, and the Greatest Race the World Has Never Seen. It comes back to the frequent wearing of heavily padded shoes changing the way we walk and run. Simply put, you can really hurt yourself if you try to jump in on this without giving yourself adequate adjustment time. Some of the recommendations say three months of slow adjustment to the shoes, but I don’t think that’s enough. Katy Bowman, the biomechanist whose work I’ve mentioned in some other posts, says give it at least a year of work. She’s put a book out on the topic called Whole Body Barefoot: Transitioning Well to Minimal Footwear, and though I haven’t read this one specifically yet, I have heard and read a lot of her other work on the topic via blog posts and podcasts, and she has a great handle on the transitions from poor to proper movement in general. I feel comfortable in recommending this book to you. I will be reading it and reviewing it soon. My experience with this transition is as follows: I switched into VFFs (the aforementioned KSOs) in the spring of 2011, about a month and a half before my first OCR, the Warrior Dash. I initially had a lot of calf-soreness as I adjusted to a mid-foot strike from a heel-strike, but I felt after that short period of training that I was ready to go. 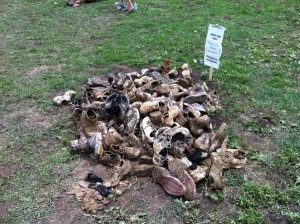 I found that the shoes were a great benefit in the Warrior Dash race as I pointed out above. I had a tiny bit of heel soreness, but the course was very hilly and there wasn’t a whole lot of heel striking going on anyway because of the terrain. But my next race, the Ruckus Run about a month later (no link because this race isn’t around any more, unfortunately), was a different story. This was a primarily flat course run partially on a parking lot, and was about a mile longer. And while I knew the proper form for running such a race on pavement and had practiced it, it 1) wasn’t something I was doing instinctively yet, and 2) as I tired my form broke down and I was heel striking much more than I should have been (which was not at all). A few hours after the race and for a few days afterward, my Achilles heel was very inflamed. I was out of commission for pretty much the rest of that summer from racing because of it. Now, having switched over to minimalist shoes full time and taken pains to train correctly in them, I am fine and have no further problems. But avoid the problems I did have by taking it easy on this adjustment period and do it with the knowledge that people like Katy Bowman offer. Now some specifics: until last season when it finally wore out, the model I wore is the Spyridon LS, a trail-running model that has worked out really well for me. I used to run in their KSO model and those were also awesome. They didn’t have the lugged soles you see in the Spyridons, here, and occasionally that was a problem, but rarely. I successfully ran for three seasons in those shoes and only stopped because my toes broke through the stitching after the 2013 Mud Ninja race (again, at the end of my third season of OCR, mind you). I ran the 2014 race in the Spyridon LS and was suitably impressed. There is a model made for OCR, called the Spyridon MR. I haven’t tried it, but I don’t honestly see the difference (unless that difference is weight and water-shedding ability, which is hard to see from the picture, obviously). I won’t say don’t get them. After all, they’re the same price as my LS model. I will not say that I always wear VFFs. Obviously I don’t wear them at work, or even 100% of my non-work time. I wore them to work once, and I got so many annoying questions and comments about them that it was distracting. But I do wear minimalist shoes almost full-time. I wear VivoBarefoot shoes most of the time. I wear their “Gobi” model at work – it looks like a traditional chukka boot but has minimalist, no-drop soles (no-drop indicates that there’s no raised heel – the entire sole is flat). I also have a pair of their Ultras that are sort of my go-to road-running shoe, as well as water shoe and super-hot weather shoe. I like the VivoBarefoot shoes because they look like normal shoes, mostly, and they provide the soles that I want – that is, almost no sole. They also give you plenty of room to move your toes around inside the shoes. This way I get as close to proper, natural foot movement as modern society allows 24/7. I think the only time I wear shoes with heels and soles is when I have to dress up, which isn’t too often. I probably whine more about my feet than the ladies wearing high heels at such events. It’s sad. Ask my wife sometime. The obligatory gross pile of post-OCR-race shoes. Some people don’t care for VFFs because they say the shoes get too stinky. They definitely do have a high funk level after a time. This is because, normally, you don’t wear socks with them unless you have a colder weather model and have some Injinji socks to wear with them. But I haven’t ever worn socks with my VFFs. I just wash the things in the laundry. I toss a pair or two (I also have a pair of VFF Seeyas and VFF KSOs that I wear casually when I’m not in the office or racing) into the washing machine, and then air dry them. Don’t put them through the dryer, that can damage them. They smell fine after that. Many people like to toss their shoes after a good mud run. You’ll see those giant piles of nasty shoes at the end of most races and that’s awesome – they help a lot of people. But with VFFs you probably won’t want to do that because they are just so functional and reusable. And being easy to clean without ruining them really does help. So that’s it. What sorts of shoes have you worn to race and train in? I’d be interested in your feedback! ← “Why Would You WANT To?